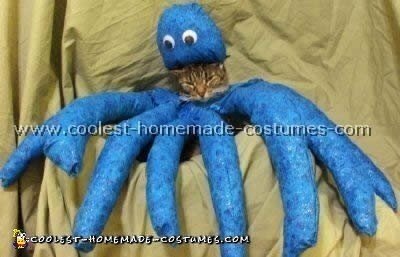 This cat Halloween costume is pretty easy. I cut out of newspapers a pattern of a long leg for the eight legs. The head was like egg shaped but cut in half. I used two big goggle eyes, elastic around the bottom of the head to keep it on. I attached the legs to a cloth cut in a circle like a doughnut with the hole in the middle to go over the head. I used regular stuffing to stuff it with and that’s it. It took me a few days to do; I don’t have a sewing machine. I came up with this idea because my cat is 17 years old and doesn’t like to stand for photos especially with a costume on! So this works well for older pets that you can just dress up for a photo. I’m sure it would look great on a bigger dog, what’s great is you can make longer legs for a big dog or small legs for a cat or small dog . Hope you like it!